This kit is complete with everything you need to get recharged. Using a standard AC outlet, you'll be able to charge 2 AA or AAA NiMH batteries. It even comes with 2AA NiMH batteries and the adaptor plugs you'll need for the U.S., U.K., Australia and Europe. 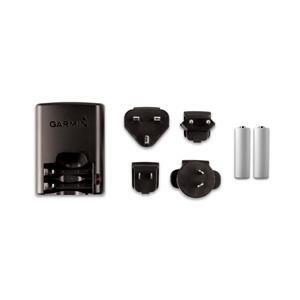 If you own the Astro 220 or Astro 320, this kit is an affordable addition to your Garmin GPS tracking gear.